As a reporter, some stories remain evergreen in your memory. One of such is the interview with Moses Olaiya, the comedian who recently passed away. As I pondered on his death, my mind went to the interview I had with the man popularly called Baba Sala published thirty years ago in the Sunday Concord of April 17,1988. How time flies! He is the man born to make you laugh. And he has never failed at that. Every move he makes. Everything he says. Every cloth he wears. Every role he plays. They all provoke one thing: laughter, rib-cracking laughter that explode among theatric audience like fire in the savannah. You know him. He needs no introduction. He is Baba Sala or better still Lamidi Sani, the alter ego of Moses Olaiya Adejumo. Baba Sala and Moses Olaiya Adejumo is what Dr. Jekyll is to Mr. Hyde. Dr. Jekyll can transform into Mr. Hyde and not be spotted. Not so for Moses Olaiya Adejumo (MON). Even without the Baba Sala makeup, the fans still know and recognize Moses Olaiya Adejumo as the man behind the Baba Sala mask. Children follow him like the famous Pied Piper. They touch him. They laugh. They call his name. Everybody loves to meet this man of mirth—young and old. In real life, people still expect Olaiya to be Baba Sala. They expect him to act and say funny things that would make them laugh. But not so for Olaiya. 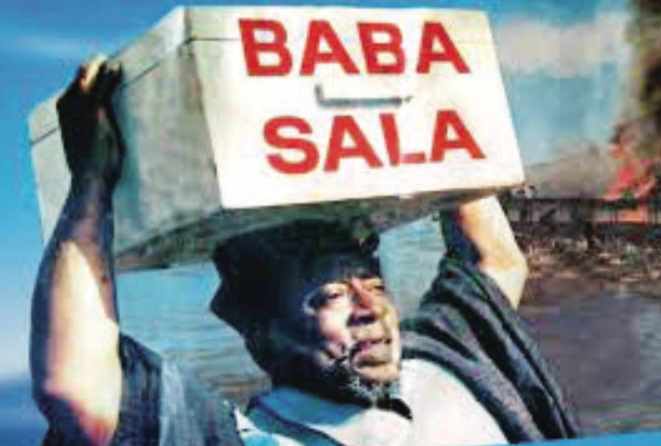 Although the world of Baba Sala is different from Olaiya, they occasionally collide resulting in Olaiya being compelled to play the role of Baba Sala in public without make-up. Take this instance: About five years ago, Olaiya’s car broke down on Eko Bridge. At that time, it was a serious offence for a car to break down on the bridge. The penalty is that the car would be towed by the police almost immediately and the owner made to pay a fine. Olaiya had a problem with his carburetor which was overflowing with petrol. It needed to cool down for a while for the engine to start again. Within a twinkle of an eye, the police were near. Olaiya sensed trouble. So he had to come out of his car and switched on his act as Baba Sala. A big scene was created. Everybody was shouting Baba Sala! Baba Sala! Many people trooped to the scene to watch a free show. They all started laughing. “They thought I was joking, but I was damn serious,” Olaiya told me. “I wasted some time. By the time I got back into the car, the engine was ready to start again. I kicked and the engine responded. I intentionally caused the sensation to escape police trouble. Another source of inspiration is the childhood tales of the tortoise which his mother used to tell him. “It’s very funny,” Olaiya says. “The tortoise is like Baba Sala character. I always like tortoise stories. I think of those stories, turn them round, develop them into human beings, just to create fun.” Olaiya’s love for comedy started from childhood when he cultivated a habit of dressing outlandishly, wearing the dresses of his big sister and her make up to make people laugh. Cracking jokes came naturally for him at home and at school. He was born to clown. Olaiya is a pioneer in the field of professional comedy in Nigeria. Before him there had only been court jesters stationed in palaces to make kings laugh. After him came other professional comedians like Baba Mero, Aluwe, Jagua, Samanja, Zebrudaya, Baba Suwe and the rest of them. Olaiya says he went into comedy as a means of carving an identity for himself, to be different from other acting groups that were mainly involved in serious plays, historical plays and situation plays. “I wanted something that would make me popular. So I chose comedy. Initially, people discouraged me saying I would run out of ideas and that I would not be able to sustain comedy for too long before I become a bore,” he recalls. Nobody has found Baba Sala a bore. Rather, Baba Sala has grown into a legendary farcical character who chases sadness away and brings laughter on every face. Not only among the Yoruba-speaking but also among other Nigerians. Olaiya’s Alawada Group acts in pidgin when they travel to the non-Yoruba-speaking parts of the country and they still succeed in making Nigerians laugh. Beneath the veneer of laughter is a moral lesson. “My plays aim at not just being funny. At the same time, I want to teach morals. I also make jest of what is happening in the society— like the boss chasing the wife of his worker and the worker catching the two of them in the office and the boss trying to bribe him not to blow out the scandal. I interviewed Olaiya at a point where his film Aare Agbaye had been pirated and he owed a bank one million naira. Threatened with bankruptcy, Olaiya contemplated jumping from Eko Bridge into the Lagos lagoon in a last horrific goodbye to the world of humour which he ruled—and he still rules. He was rescued by Good Samaritans like the late Chief MKO Abiola and a few generous men who gave him money which he used in making his film Mosebolatan.